Does WorkCompEDI submit electronically and directly to Sedgwick? 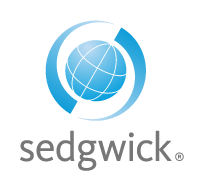 YES – Sedgwick and WorkCompEDI have teamed up to maximize electronic submissions for Sedgwick clients and have invested a great deal of resources to maximize the value of the partnership. Sending Sedgwick bills through WorkCompEDI ensures your transactions are being received and processed in the most efficient and timely manner. What Payor ID should I use to submit eBills to Sedgwick? You should use the specific Payor ID issued to the Sedgwick client in order to ensure your bills are adjudicated in a timely manner. Use the Payor ID Lookup tool on the WorkCompEDI website to find the right Payor ID for your designated receiver. Do I have to use WorkCompEDI to reach Sedgwick? NO – while submitting your billing through WorkCompEDI is the fastest method to reach Sedgwick (since all bills are delivered electronically within 24 hours of receipt), your company can send bills through your vendor-partners who may be connected with WorkCompEDI. While this adds 24-48 hours to your bills reaching Sedgwick (depending on your vendor-partner’s processing guidelines for delivery), your bills will reach Sedgwick . What are the advantages of working with WorkCompEDI to reach Sedgwick electronically? The most significant benefit is that WorkCompEDI submits directly to Sedgwick which means your transactions are delivered to Sedgwick within 24 hours. Once you are setup with WorkCompEDI to submit eBilling to Sedgwick , you can also reach over 3,100+ other electronic receivers. Plus, WorkCompEDI is an all-Payor clearinghouse, which means if the receiver you are trying to reach does not accept electronic transactions, WorkCompEDI will print & mail your bills and attachments using 1st class USPS at no additional cost! Not to mention, you will have a partner in the race to submit clean bills in a timely manner, along with enhanced tracking and validation of your submission. Is there a cost to submit electronic bills through WorkCompEDI? There is a simple per-transaction charge of $0.65 per bill (with unlimited attachments) to use WorkCompEDI as your submitting partner. Keep in mind, the industry average for electronic bill submission to work comp carriers can range from $0.85 to $1.00 per bill, and most vendors will charge you extra for bills that need to be printed & mailed when an electronic connection does not exist. Added values include no setup or hidden fees, a month-to-month agreement, free access to our iCompEDI™ billing management portal, no additional fees for support and valuable tracking reports that provide date & time stamps along with tracking numbers for each bill you submit (whether delivered EDI or paper). Can I submit bills and attachments to WorkCompEDI directly? YES – WorkCompEDI can provide you with a powerful submission tool that uses bill data generated directly from your existing practice software tool. Your staff doesn’t need to re-type bill information into our systems or spend time stuffing envelopes. Simply use your existing practice software to create and submit electronic bills and images of supporting documents through our iCompEDI™ billing management portal. What bill data and attachment file formats do you accept? 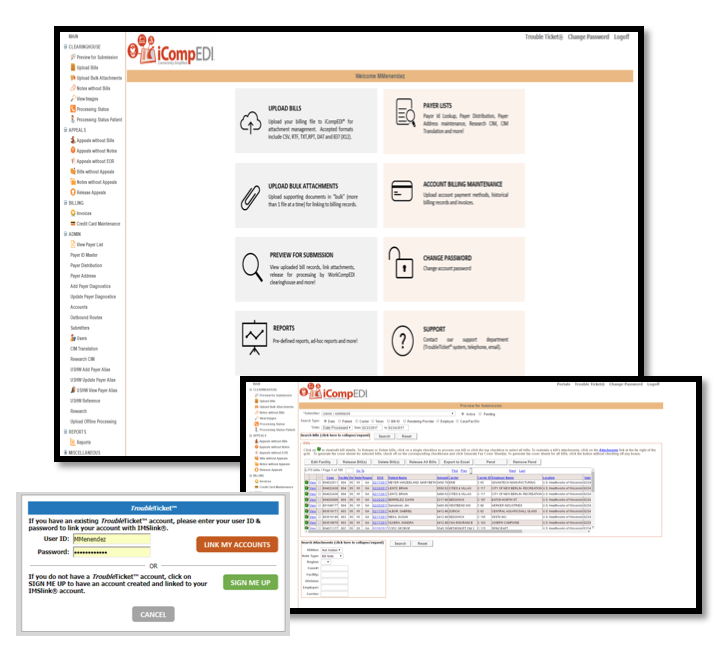 WorkCompEDI accepts ANSI X12 837, print image, and custom formats for bill data, and PDF, GIF, JPEG, TIFF and other standard image formats for supporting documents. Can I send bills and attachments through my existing practice management software vendor? YES – WorkCompEDI maintains a large network of cooperative practice management software vendors focused on the P&C industry. Some of our key partners include Conexem, MedBillIQ, Prime Clinical, RevClaims, Cube Heatlhcare, and many more. What about my existing clearinghouse – can I use them to reach Sedgwick through WorkCompEDI? YES – WorkCompEDI maintains one of the largest network of cooperative clearinghouses in the P&C industry. Some of our key partners include Change Healthcare (RelayHealth), Cognizant (Trizetto), Availity (RealMed), Jopari, Optum (P2PLink), and more! Where your vendor is connected with WorkCompEDI, you can submit bills to not only Sedgwick , but also thousands of other receivers. Since there are no up-front or monthly expenses, you have no risk in establishing an account with WorkCompEDI to submit eBilling. However, if we fail to provide you with 100% customer satisfaction, and you wish to terminate your service agreement, we will easily cancel your service with our company. WorkCompEDI offers an array of ways to submit your bills to our firm for processing, including: 1.) output a flat file of bills and images from your software and send it to WorkCompEDI directly (using a secure FTP tool); 2.) you can submit your bills using our iCompEDI™ portal (using many formats, including ANSI X12 837, print image, or proprietary) and either upload your supporting images directly (as single images or a bulk of images), or you can fax your documents using the barcoded fax cover sheet generated for each bill; or 3) you can fax both bills and supporting materials to our firm and receive your reports back through your fax machine using our CompFax® service, where we convert the data off your faxed bill into EDI for submission electronically to receivers. In all cases, you can use any combination of the options above to meet your needs. You can use iCompEDI™ or submit a flat file of your bills, and then use our fax-to-EDI CompFax® service to submit your supporting documents for each of the bills. If that doesn’t work for your existing workflow, you can submit your bills via iCompEDI™ and then send us a single file of images with an index file. Or, we can work with you to create a process that works for your office to ensure it does not disrupt your existing billing workflows. It comes down to what is easiest for you and your organization. YES – WorkCompEDI always provides back an “Immediate Verification” report outlining each bill transmitted and whether it was accepted or rejected by our clearinghouse front-end edits. Then, we will pass back any information provided by the receivers as they adjudicate the transactions, and in some cases even pass back electronic remittances (835) which we can return as an ANSI X12 835 file or as a human readable report. Most importantly, you will have a record of your submission, including a tracking number for each bill, which provides immediate appeals validation when discussing timely filing concerns. Just email (sedgwick@workcompedi.com) or call our dedicated account management team at (800) 297-6909. We can go over the options that best suit your needs and get you started on the road to saving time and money. If you prefer, please visit our website at www.workcompdi.com and use our online registration portal to get started – we’ll contact you as soon as your account is ready to go! WorkCompEDI provides submitters (doctors, hospitals, clinics, billing companies and others who submit billing outwardly for reimbursement) a single-source, all-payor turnkey partner for eBilling services in the Property & Casualty (workers’ compensation, auto, and personal injury markets) with access to over 3,000+ electronic receivers (employers, bill review firms, insurance plans, networks and others who receive and process billing). Using a combination of WorkCompEDI products and services, submitter clients can submit all bills and notes – to all payors – in a flexible method, without hidden fees. A single & direct point of connectivity to the entire workers compensation, auto and personal injury markets for a SUBMITTER. 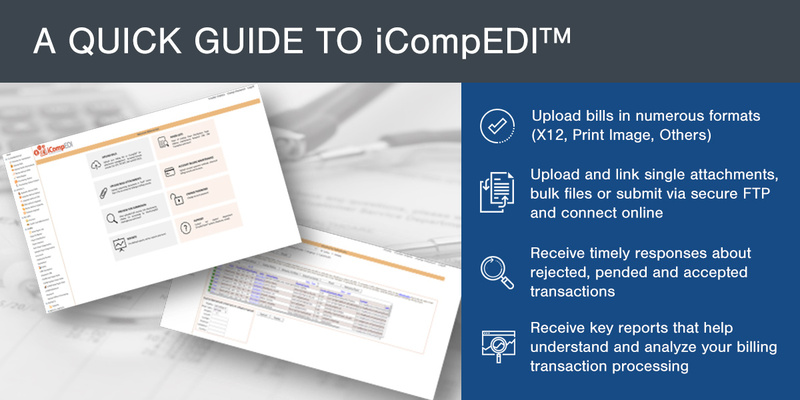 iCompEDI™ supports nearly all data formats and connectivity workflows to simplify adoption and access for submitters. Ongoing adjustments and compliance with jurisdictional and EDI requirements are handled by WorkCompEDI without effect to customers. WorkCompEDI retains established integration or interfacing partnerships with the following market leading vendors. Each relationship brings a different level of white-label or custom integration capabilities to end-users, limiting learning curves and enhancing adoption.